For all life stages, this high-protein, zero grain formula provides highly digestible energy and limits exposure to allergy triggers. 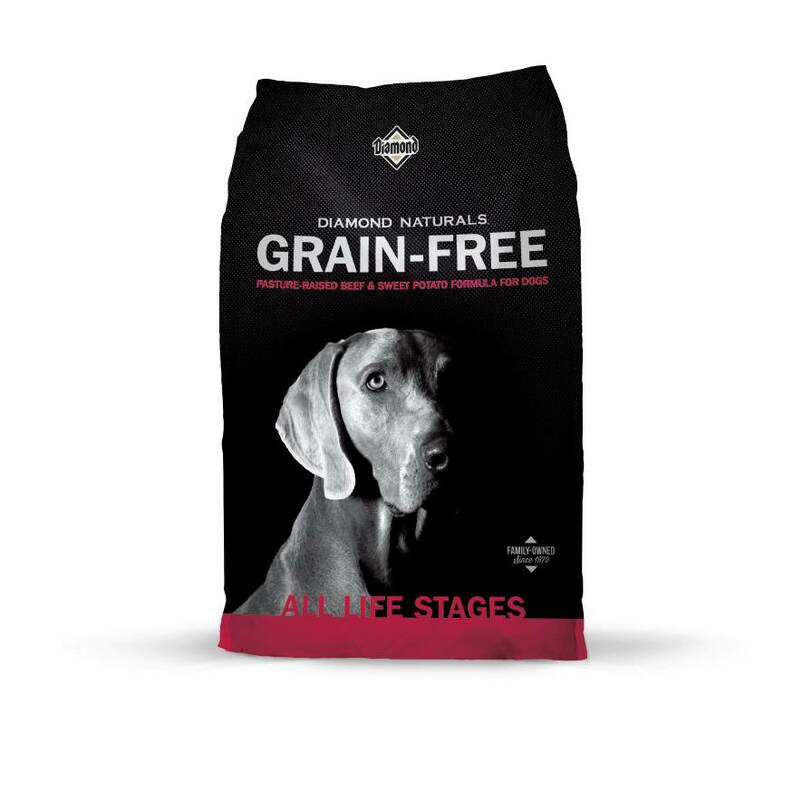 The first ingredient in every Diamond Naturals Grain-Free formula is always high-quality animal protein. Pasture-raised beef provides superior taste and nutrition, while sweet potatoes provide complex carbohydrates for all-day energy. Vegetables and fruits add powerful antioxidants for optimal health and vitality. Beef, lamb meal, sweet potatoes, peas, lentils, pea flour, canola oil (preserved with mixed tocopherols), tomato pomace, flaxseed, fish meal, natural flavor, salmon oil (source of DHA), salt, DL-methionine, choline chloride, taurine, dried chicory root, yucca schidigera extract, tomatoes, blueberries, raspberries, dried Lactobacillus plantarum fermentation product, dried Bacillus subtilis fermentation product, dried Lactobacillus acidophilus fermentation product, dried Enterococcus faecium fermentation product, dried Bifidobacterium animalis fermentation product, vitamin E supplement, iron proteinate, zinc proteinate, copper proteinate, ferrous sulfate, zinc sulfate, copper sulfate, potassium iodide, thiamine mononitrate (vitamin B1), manganese proteinate, manganous oxide, ascorbic acid, vitamin A supplement, biotin, niacin, calcium pantothenate, manganese sulfate, sodium selenite, pyridoxine hydrochloride (vitamin B6), vitamin B12 supplement, riboflavin (vitamin B2), vitamin D supplement, folic acid.